On the heels of last week’s Star Trek: Discovery Starfleet cast announcement, CBS has today revealed three new Klingon cast members! Joining the CBS All Access series are Juilliard-trained actress Mary Chieffo, Penny Dreadful‘s Shazad Latif and Chris Obi, who also stars on Bryan Fuller‘s upcoming STARZ series, American Gods. The new Klingon cast additions join previously-announced Star Trek: Discovery stars Doug Jones (Pan’s Labyrinth) as Lt. Saru, Anthony Rapp (Rent) as Lt. Stamets, and Michelle Yeoh as Captain Georgiou. Star Trek: Discovery takes place about a decade before the original Star Trek and roughly a hundred years after Earth made first contact with the Klingon species (as depicted in the Star Trek: Enterprise pilot, “Broken Bow”). At this point in Trek history, the Federation and the Klingon Empire should be facing an uneasy cold war. Following its May 2017 premiere on the CBS Television Network, all episodes of Star Trek: Discovery will be available in the U.S. exclusively on CBS All Access. Continuing the worldwide appeal of the franchise, each episode of the series will be available globally within 24 hours of its U.S. premiere, presented on Netflix in 188 countries and through Bell Media platforms in Canada.Star Trek: Discovery has revealed three members of its Klingon cast. 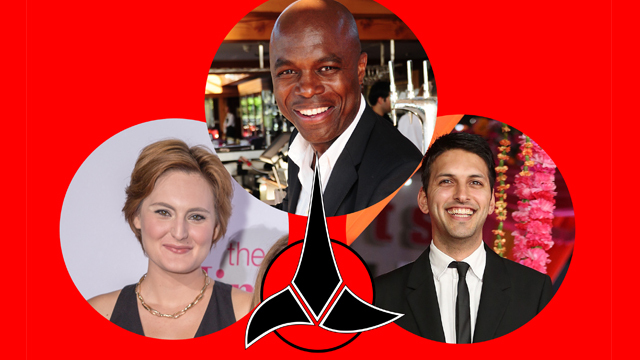 Check out details on new characters played by Mary Chieffo, Shazad Latif and Chris Obi. Star Trek: Discovery is executive produced by Bryan Fuller with Gretchen Berg, Aaron Harberts and Academy Award winner Akiva Goldsman manning the bridge. What do you think of the new Klingon cast additions? Who else would you like to see join the Star Trek: Discovery cast? Share your thoughts in the comments below!